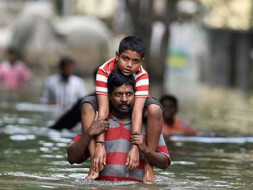 At this point of time over 200 people have been reported dead due to the floods in Chennai. 18 of these people were patients in hospitals on ventilators. When the water cut off power supply these patients were left helpless. It is important to remember that 200 is only the intial death toll, and if past disasters have taught us anything, it is that intial death tolls are always severly unerestimated. INR 59 Even a small donation can make a difference!! This will buy mosquito repellent. Higher donations of money are greatly appreciated but every penny makes a difference. Due to limitations imposed by this website we can only accept donations of values greater than INR 100 or $5. The people of Chennai are in dire need of shelter, food and clothing, lets help give that to them. Funds raised from this campaign will be donated to organizations such as Goonj to facilitate the best use of this money. Please spread the word about this campaign if you are unable to donate money, it would be greatly appreciated.